UPDATE: Crash investigations are continuing into the cause of a triple fatality west of south-west of Toowoomba yesterday. Forensic Crash Unit officers are continuing to determine what caused the silver 4WD wagon to cross onto the wrong side of the road and into the path of an oncoming cattle truck travelling on the Gore Hwy at Brookstead yesterday. Police have identified the crash victims as a 46-year-old man and a man and a woman aged in their 80s. They were from New South Wales. The male truck driver, the sole occupant of the heavy vehicle, was not physically injured. TUESDAY 4PM: Three pensioners on an interstate holiday died in what authorities called a horrific crash no-one should ever have to witness. Two men and a woman, all aged in their 60s, died instantly when their silver 4WD wagon crossed into the path of oncoming cattle truck on the Gore Hwy at Brookstead shortly before noon today. The truck driver, aged in his late 30s, was physically uninjured but has been offered counselling to help recover from psychological scars from the shocking crash. The 62 head of cattle on board the truck were uninjured in the crash which closed the major highway for more than three hours. Police were this afternoon trying to piece together what caused the wagon to cross to the wrong side of the road. Forensic Crash Unit investigators were working to identify the three people killed. 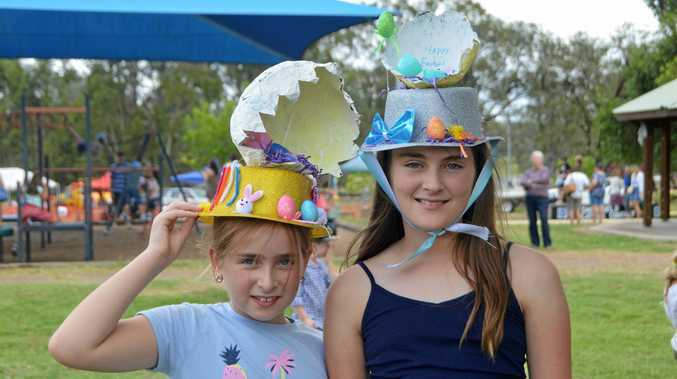 "It would appear they were from interstate," Pittsworth police officer-in-charge Sergeant Rob Patterson said. "The vehicle is registered in New South Wales and there are items inside the vehicle that indicate they are from New South Wales." Sgt Patterson said the livestock rescue was balanced against the need for a full forensic examination of the scene, but initial investigations suggested the 4WD had crossed onto the wrong side of the road. The truck had been carting cattle from Forbes, New South Wales, headed to Dinmore, east of Toowoomba when the collision occurred. The scene of the horror triple fatal crash at Brookstead south of Toowoomba. Witness statements suggested the 4WD had been travelling south along the Gore Hwy, and neither vehicle is believed to have been speeding. 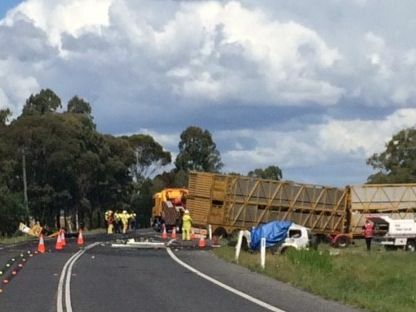 "From our initial investigations it would appear the cattle truck has been travelling on the left hand side of the road and for some reason, the station wagon has veered onto the incorrect side of the road and come into collision with the truck," Sgt Patterson said. "It's a horrific scene, as you can imagine after a vehicle has come into collision with a truck head-on. "It's something no-one should ever see, I don't think, but then part of you thinks that maybe if people did see this then maybe they would change the way they drive on the road. "It might change their behaviour if they had to witness something like this. "As on all highways where there's a speed limit of 100kmh, whenever you have a crash it is going to be fairly serious, but this is by no means a back spot." Queensland Fire and Emergency Services Kitchener St station officer Tony Guse said the triple tragedy was a reminder to all motorists to be cautious on the roads, especially during long trips on highways. "Leading into the Christmas period, we urge people to be very mindful of the Fatal Five and be very aware that when you're travelling long distances to take regular breaks," he said. Queensland Ambulance Service senior operations supervisor Brad Setch it was a tragic part of the job for paramedics to attend fatal crash scenes, and added his voice to the plea for motorists to be safe on the roads. "So we just urge all drivers to drive with care and take their rest pauses, who knows what (the) cause of this accident was but try and drive with everything in your favour," he said. The cattle were cross-loaded to another truck at the scene before being carted off. The highway was cleared of the extensive debris and reopened to traffic. The triple fatality brings the Darling Downs road toll to 23. Triple fatal crash, Gore Hwy: Three people were killed when the vehicle they were travelling in collided with a B-double at Brookstead near Toowoomba. 2.30PM: Two men and a woman aged in their 60s have been killed in a horror crash on the Gore Hwy south of Toowoomba. They were travelling in a Toyota Prado when it collided head-on with a B-double cattle truck at Brookstead, 60km south of Toowoomba about 11.30am. Queensland Ambulance Service senior operations supervisor Brad Setch said it was unknown what had caused the crash. "The conditions appear to be good, because the weather is clear and the roads are nice and open," he said. "None of the paramedics enjoy responding to these incidents." The driver of the truck was not injured, but is being treated at the scene for shock. Mr Setch said the three victims died at the scene. "Three people in the car were the sole occupants of the vehicle," he said. "There's been an extensive lot of damage to the truck but the truck driver is fine, he's emotionally upset as you'd expect. "So we just urge all drivers to drive with care and take their rest pauses, who knows what (the) cause of this accident was but try and drive with everything in your favour. "It's very sad, it's very sad that we're out here on the highway again with the loss of three lives." Authorities have closed the highway in both directions. Delays are expected to be extensive as emergency services investigate the incident and clear the scene. Traffic is being diverted via the Old Gore Hwy, Brookstead. 12.45PM: Three people have been killed in a horror crash between a 4WD and cattle truck on the Gore Hwy south of Toowoomba. 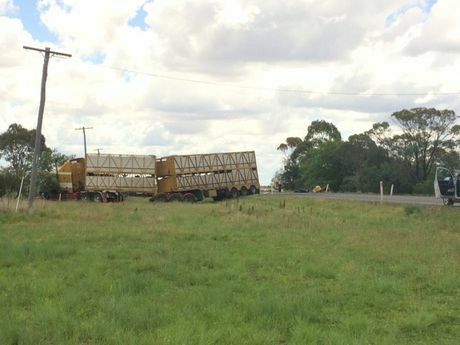 The three people, believed to be aged in their 60s, were travelling in a Toyota Prado when it collided with a B-double loaded with cattle at Brookstead, about 60km south of Toowoomba. The crash was reported about 11.28am. The driver of the truck was not injured in the crash but is being treated at the scene for shock. The cattle truck involved in a crash on the Gore Hwy that killed three people. 12.15PM: Three people have been seriously injured in a horror crash on the Gore Hwy south of Toowoomba. A Toyota Prado collided with a B-double loaded with cattle near Brookstead. There are concerns those travelling in the Toyota may have life-threatening injuries. Emergency services have closed the highway in both directions. 11.45AM: A car and cattle truck have collided on the Gore Hwy at Brookstead, west of Toowoomba. Emergency services have arrived at the scene the incident, which occurred on the bypass at Brookstead. There are reports of serious injuries to several motorists. The B-double was fully loaded with cattle. Queensland Ambulance Service is advising motorists to use caution if driving around the area. They reported the crash occurred at 11.28am. The highway is blocked in both directions.